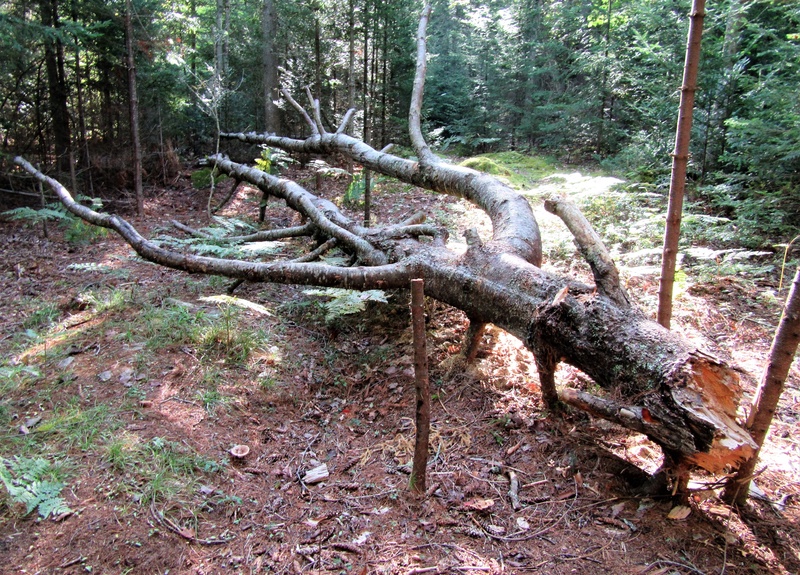 … for me, even a fallen tree. If looking at a tree can be a divine experience, or something transcendent, then what may be revealed or experienced when you spend a few days intimately connecting with every part of a big fallen tree and everything on the ground surrounding it, including clearing away many other trees that it fell on, changing it to a playground shaped from what had been a big obstacle fallen onto and blockading an important trail? What does that intimacy reveal? 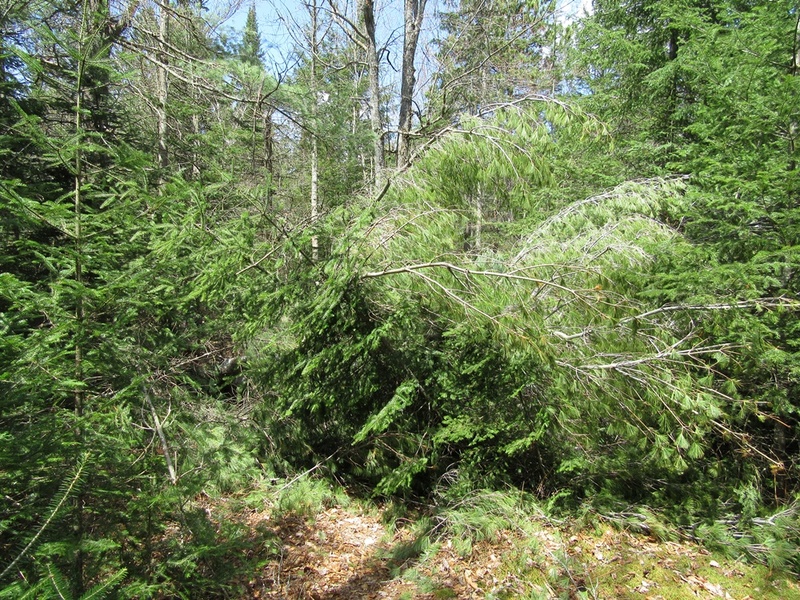 The wind snapped off this big white pine at a point where its trunk had divided and where it became infected with a fungus common among white pines. 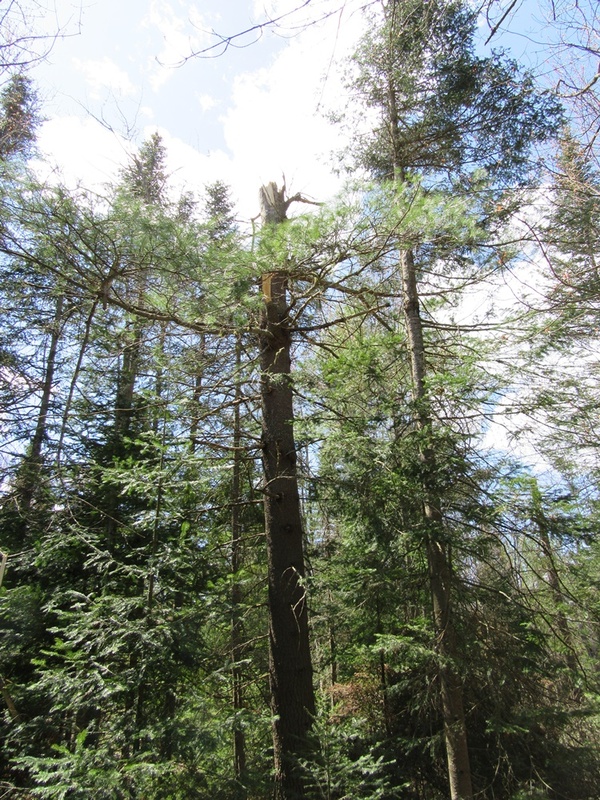 This “stump” will die and become a tall snag that will stand potentially for decades, and be a great resource to wildlife. The trail formerly passed through the middle of this. 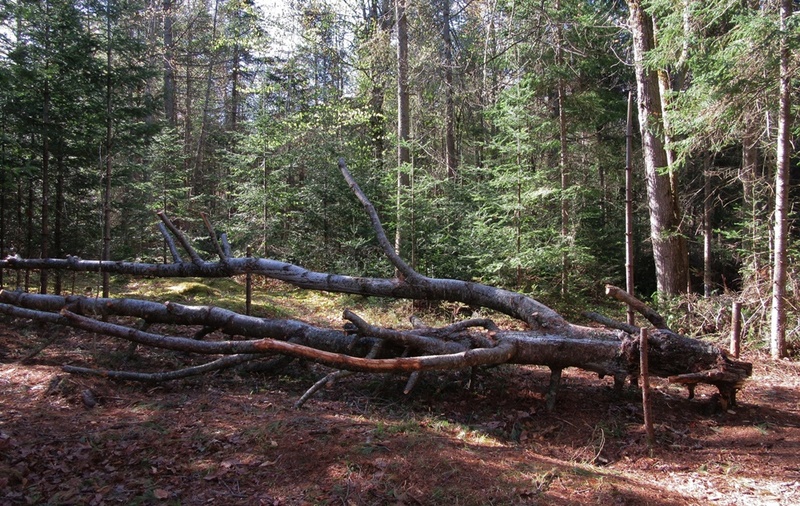 There are many smaller trees crushed under the big pine’s limbs and branches. One favorite was spared the crushing: a young hawthorn, the only one we have that has survived deer browse long enough to become more than a tiny shrub. 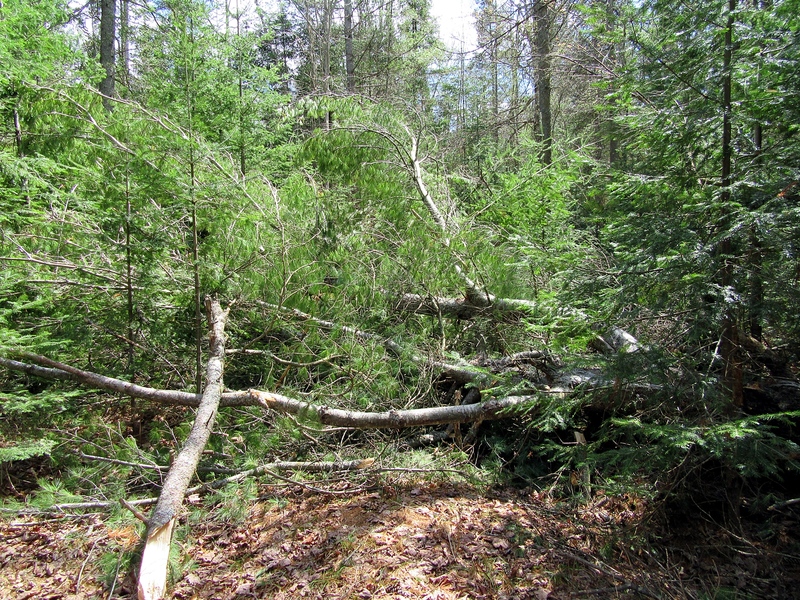 When nature clobbers a trail with a big tree, and I work with it instead of against it, the outcome is a better trail. Nature has contributed greatly to the styles and routes of trails here, and she loves change. Cadivus is a Latin word meaning fallen or windfall, translated in the usual sense of “a sudden gain,” and in the sense of “fruit blown from a tree.” The wind gave me a windfall-deadfall where an abundance of new life began, forever shaped according to a merger of the tree and me. Nothing really died. It was transformed. Cadivus. The trail formerly went through the middle of this. It now goes around the right edge of the picture … unless you have that childlike urge to hop onto this natural playground equipment. Then the trail goes where you take it, all over this playground. This is only about four fifths of the tree. It extends farther to the left, where the ends of the limbs are especially bouncy. That place, as it exists now, is an expression of me. The tree drew me into combination with — immersion with — its nature. Now I am there forever. Cadivus is on Whitetail Way, at the south end of Blueberry Pass, on the east side of Maplegate Square. So Cadivus is not a “wild” place, if you count human influence as unwilding. It is a widened wild. Perhaps Natalie Goldberg would call it an expression of wild mind, or simply wild mind itself. See her 1990 book, Wild Mind; Living the Writer’s Life. I don’t keep many books, but this one has sentimental value that has kept it on my shelf since 1995. … wild mind surrounds us. Western psychology calls wild mind the unconscious, but I think the unconscious is a limiting term. If it is true that we are all interpenetrated and interconnected, then wild mind includes mountains, rivers, Cadillacs, humidity, plains, emeralds, poverty, old streets in London, snow, and moon. A river and a tree are not unconscious. They are part of wild mind. I do not consider even a dream unconscious. A dream is a being that travels from wild mind into the dot/monkey mind/conscious self to wake us up. So our job as writers is not to diddle around our whole lives in the dot but to take one big step out of it and sink into the big sky and write from there. Let everything run through us and grab as much as we can of it with a pen and paper. Let yourself live in something that is already rightfully yours — your own wild mind. I think what good psychotherapy does is help to bring you into wild mind, for you to learn to be comfortable there, rather than constantly grabbing a tidbit from wild mind and shoving it into the conscious mind, thereby trying to get control of it. This is what Zen, too, asks you to do: to sit down in the middle of your wild mind. This is all about a loss of control. This is what falling in love is, too: a loss of control. Can you do this? Lose control and let wild mind take over? It is the best way to write. To live, too. -pp. 32, 33. You’re allowed to be wild when it’s just scribblements (like this one). Who knows how wild it may get! It seems to take a lifetime for me to discover unsearchable things I know exist within me. This entry was posted in Flora, Forests, Nature Writing, Trails, Trees, White Pine and tagged Cadivus, Natalie Goldberg by The Balsamean. Bookmark the permalink.